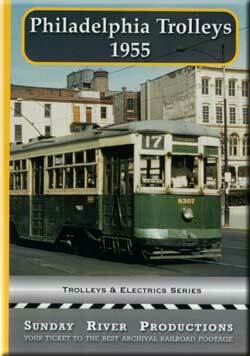 Here is an all color film about Philadelphia Trolleys in 1955. 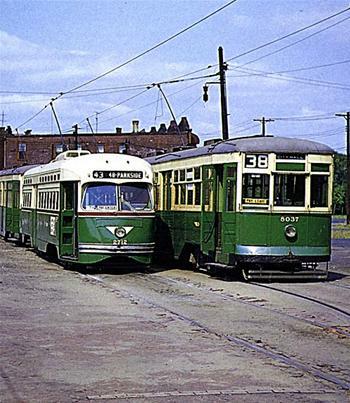 Philadelphia was likely, the largest and busiest trolley system in 1955. Originally Produced by Alva Morrison. Digitally remastered in 2009. The old film looks excellent. Vibrant colors and it has a neat appearance. Maps are used to display the routes of the trolleys that are followed. Many cross streets are identified by the street sign close-ups. You will usually know where you are, or at least what route you are traveling. Narration is minimal on this show. A few facts and brief location info is about it. On screen graphics display many noted locations. Well organized, and easy to follow show. Audio is a little odd. There are trolley sounds, which were some original recordings from the time. Of course, this all dubbed sound. These original films were probably ‘silent movies’. So, you won’t hear normal automobile and truck traffic. The trolleys often are shown, and heard, running in traffic, right down city streets. Perhaps, this is not important. I just have to note that in this review. Personally, it doesn’t seem critical. after all, we are here to see the trolleys. A brief musical background is used on the transitions. This large supply of film on the trolleys is rare. Let’s roll the movie. This show is nearly all action trolley scenes! They travel the streets and the backgrounds provide a look at life in 1955. Look for: Esso gas station, a milk delivery truck and a sign for an A&P grocer. Other small businesses are visible.See the Delicatessen featuring Knish. Vintage cars and trucks are easily viewed on the clean film. Many automobiles travel the city streets. The 1955 Chevrolet Bel Air taxis, in taxicab yellow. Classic pickup trucks from the era.Seen are the various residential neighborhoods, giving a cross section of the city. Route 20 covers the entire city, north- south direction. Route 6 was the rural route. It ran northbound, out to the countryside. Alva speaks of how old trolley companies would often build an attraction, such as an amusement park at the end of a rural route. This would give riders: a scenic ride, and a nice destination. Not too mention, added revenue ridership for the trolley line! Some very green and wooded sections of the line, make a pretty setting. This is all on private right of way. There is a chapter menu. The chapters are divided by the different routes or areas. PTC North, PTC Central, Routes 11 & 62, Route 37, Routes 10 & 38.. Notable locations seen are : Municipal Stadium, Logan Circle, Market Street, City Hall, Independence Square, Front Street, 42nd Street and more.Closes with Fairmount Park. Nicely filmed, remastered, and smoothly sequenced. Those qualities do carry this show. A good look at the Philadelphia trolley system operation. Trolley fans should find much enjoyment in this show. This entry was posted in ATVR Reviews, Sunday River Productions and tagged American Train Video Reviews, electric, new releases, transportation, trolley by William J. Hudson. Bookmark the permalink.